Uh-oh, it's a boy. For new mothers, understanding the world of boys can be puzzling what with their obsessions with dinosaurs, construction machinery, Star Wars, pirates, and, well, guns. Big Rigs for Moms is a friendly cheat sheet for new moms that demystifies these topics, from trains and trucks to freaky science and insects. With a smart sense of humor, parent/author Jenna McCarthy explains just what's so fascinating about forts, knots, and even poop—and then gives moms some cool insider knowledge, a reading list, or a fun activity to share with their little man. You can give a boy a tube of glitter glue, but sooner or later he'll turn it into a weapon. Pow! "AWESOME. Being the mother of two boys, this would have been a perfect read so I knew what to expect when I was pregnant with my first son... Every single thing in this book is spot on. Having already lived what Jenna wrote, I can say for sure she covered all the bases – from dinosaurs (and lately dragons) to Superhero gear (TONS of it), this is a perfect book for a new mom to read on those seemingly endless nights of nursing and rocking their little man to sleep." 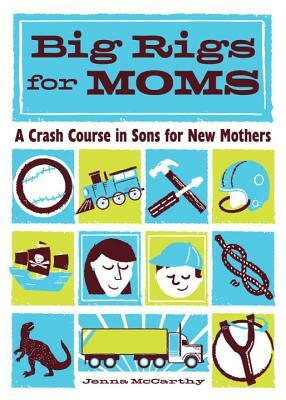 "Big Rigs for Moms: A Crash Course in Sons for New Mothers is a great baby shower gift for a new mom expecting a baby boy. It demystifies trains and trucks, pirates, freaky insects, dinosaurs, and construction machinery. Plus it suggests 'talking points!'" "This is a cute book that gives you some must need to know boy facts."